Tim Etchells and Penny McCarthy, Roderick Buchanan and Andrew Sneddon, Amanda Beech and Jaspar Joseph-Lester, Kelly Large and Becky Shaw, Jane Harris and Gary Simmonds, Juan Cruz and Sharon Kivland, André Stitt and Hester Reeve, Kate Davis and Julie Westerman, Lindsey Seers and Chloë Brown,Taconis Stolk and TC McCormack, Neville Gabie and David Cotterrell, James Pyman and Conroy/Sanderson, Hollington & Kyprianou and Rose Butler. Transmission: Host is a series of chapbooks derived from an annual lecture series organised by Fine Art at Sheffield Hallam University. 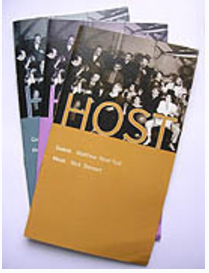 Each week a host invites his or her guest and a critical engagement is assumed. There is an ethics of hospitality: a host has a standard of conduct, and historically, hospitality has been seen as a code, a duty, a virtue, and a law. In 2009–10 we took up the idea of the friend. In the course of a life, friendships change but this is not to say that friends are interchangeable. What kind of friendship is possible between artists, between works of art, between men and women? What is a real friend? A dream from which one wakes to say, after Montaigne, who says it after Aristotle: O my friends, there is no friend.